Propshield Industrial is fast becoming recognised throughout the maritime world as the market leader in commercial propeller antifouling, saving companies thousands of pounds/dollars in saved fuel and reduced propeller repair, replacement and cleaning bills. With the current economic downturn Propshield Industrial will ensure your company keeps its competitive edge. Building on the success of its retail sibling, see www.prop-shield.com for details, Propshield Industrial increases product strength, durability and ease of application ensuring it's well up to the task of protecting all types and sizes of vessel, from supertankers to superyachts and from cruise liners to trawlers, in the most testing of environments. 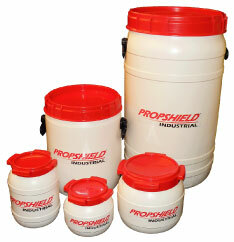 Propshield Industrial is a grease and comes in 5 available sizes, 2.75 Litre, 5.5 Litre, 10 litre, 30 Litre and 60 Litre Kegs/Barrels. Please see our coverage table for information on propeller sizes and the number that each keg/barrel can treat.